My sister-in-law, a lawyer (smart cookie!) took a day off work to give us a day on the town. We went to the Folk Art Museum where we saw some interesting crazy quilts and samplers and an exhibit featuring Henry Darger's work--he seemed to have had an inappropriate focus on little girls in his art, in my opinion. The professor's words? "That man was mental." Then another jump on the subway cross town to Kalustyan's, an amazing spice and speciality store. Loaded up with aleppo pepper, decaffeinated Turkish coffee, and some fabulous Middle Eastern sweets to fortify ourselves, we headed back up the island of Manhattan. Then we all bundled into the car later in the day to go to an intimate family party in New Jersey. Not everybody could come--there were only maybe 40 of us from the professor's family--on a school night, no less, just so we could all see each other before the professor and I came south to DC and Virginia to see my family. OK, no pictures here, but just one snapshot of the whirlwind adventure. Hope you can get a vicarious taste of our experiences from this! A brief note so you know I haven't fallen off the end of the earth. Instead, I've just managed two full days of travel (8 hour drive to Minneapolis, 2 flights to arrive at the Baltimore airport, and a drive of 4 hours or so up to New York City) to see relatives. There will be a short, photo-less pause here as we enjoy the Big Apple, New Jersey, and Virginia to visit family. The camera got packed--but the cord that connects the camera to the computer? It's having a little rest by itself on my desk in Winnipeg. Oops! In the last day or two, a new book on sustainability issues and knitting has been released. It is published by a well known company that I've written articles for quite a bit, and even a design or two. The book is written with an anthology approach, with essays by well-known people in the knitting world and top-notch designer contributions. All of this is ok--because one of my goals in writing a book about conservation, sustainability, and "greener" choices for knitters was to help more people think about their choices. In fact, when I heard about this book--maybe a year ago--I tried to be positive about it. I figured that our books wouldn't be the same...and as best I can tell (I haven't read that other book cover to cover yet) they aren't. My book has more information in it rather than personal essays. My book has a variety of designs from easy to intermediate, and likely has some projects in it that are better for the beginner knitter. So, while famous people contributed to that other book, their contents weren't the same. Things like that made the books look different, as best I could tell. Except for the titles. You see, book titles don't have to be copyrighted, and they are essentially chosen by committee. For my books, I created a long list of titles I could live with, and in each case, the publisher chose one of those titles with a group consensus. I assume the publisher researched those titles, and I googled every single one of them to be sure I wasn't stepping on anyone's toes. That's fine...I assumed that was just good manners. A lot of friends have recently discovered this other book because of all the publicity around its release. They immediately email me or call me to complain. Couldn't this other book have chosen a different title? Couldn't they have been a bit more careful? ...and yes, I have wondered these things myself, although I've known about this book for a while. In fact, back in the "olden days" of publishing, there likely would have been lawyers involved, and a last minute name change, and all sorts of efforts to avoid this situation. However, in today's whirlwind publishing world, with issues of free download piracy and ever more books being released ever faster, maybe that isn't possible. To be clear about confusion, it is the kind of situation where two books are published within 8 months of one another. The only difference in their titles is an "ing." Luckily, the subtitles are different too. I won't lie. My own personal green monster--the jealous, angry, frustrated one--has come visiting. I feel pretty annoyed, because my book came out first and yet I cannot do a thing to defend its title. I suppose this is only natural, and I'm trying hard to keep my chartreuse buddy under wraps and get her to go back into her lair. However, I also see two positive end results. First is an unintended one. That other book? The new book? 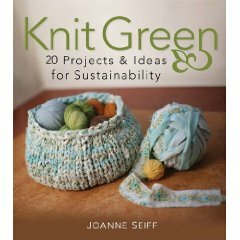 Its title is close enough to mine...Knit Green: 20 Projects and Ideas for Sustainability that it's briefly driving up sales of my book. That is, people look up those words "Knitting" and "Green" online and they find my book, too. Hopefully, they find something of value in it, and they purchase it. So, in that sense, I have to be grateful for the inadvertent free publicity...which I'm sure that other publishing company hadn't planned on. Thank you. Second though, and most important, is the bigger issue. If more people write appealing books about environmental issues, more readers might buy them. If you own a book about sustainability, you just might read it. Then, you might think about the issues, and do a thing or two about conserving our planet's resources. Although personally I'd love to sell more books (or ebooks) and maybe even make a living, on a bigger level, it's more about learning about the earth. It's about making a difference in the world and keeping our knitting -and our lives- eco-friendly. That's important stuff... Stuff I also care about. In honor of Earth Day, I've been invited to give a talk tomorrow, April 22nd, in Winnipeg. I'll be speaking at the Millennium Library downtown at 7 pm. The Manitoba Craft Museum and Library is hosting this gig, and artists and crafters will be selling art made from recycled materials before the lecture. The Museum will be selling my books, too, and appreciates any donations you can make to support their mission. After the lecture, I'll hang around to answer questions, sign books, and visit. There will be a trunk show, with samples from the book on display for everyone to touch and see. If you're local, I hope you can come! I look forward to seeing you there! If not...please feel free to join me in the comments below. If you're one of those people who contacted me about that other book and its title, I really appreciate your concern and commiseration. I have felt a bit rough round the edges. Still, I think if we can all visit with our personal monsters occasionally--letting them out from under the bed or opening up those closets...we find in the light of day that this is not the scariest thing, or at least not as scary as we'd thought it to be. Losing glaciers, polar bears, low lying islands? Extinctions or natural disasters? Maybe more of an issue in the long run. Please join me--wherever you are-- in celebrating and honoring Earth Day 2010. Spring has sprung here. We've seen our first flowers (crocuses and another blue flower that we're not sure of--the flora and fauna are all different here from what we know) The professor tested out his Manitoba butterfly identification skills today on a long walk with me--we saw one that he said was a Compton Tortoiseshell. By way of comparison, he mentioned that according to the historic records of butterfly spotting in Kentucky that he'd studied, someone saw a Compton Tortoiseshell there and it was very rare. Spotted only once in the recorded Kentucky history. So, we're learning about new moths and butterflies, too! The dogs have "livened up" as is their practice come spring. They spend a good part of every afternoon and evening roughhousing as if there is no tomorrow. When we put them out in our small fenced yard, they have to be watched every second. Every new smell and noise riles them up. Their current research project involves excavating under the foundation of our garden shed (an entirely satisfactory shed which we'd prefer not to have undermined) because something lives under there. I'm not sure what it is, exactly, but I did see a gray furry bottom-bigger than a mouse or squirrel scoot faster than lightning when I let the dogs out one time. It might be a cat that shouldn't be in our fenced yard, but it might also be something a bit more wild. Gopher, perhaps? We've no idea. We're busy defending the shed! Also, our schedules are busy, too. The professor is off on a research collecting trip for a few days this week; I just dropped him off at the airport. I've got several teaching and other social commitments too, and then at the very end of April, we're off to see family on a whirlwind trip on the U.S. east coast. So, all that said, I am really enjoying every single sunny moment when I get to work quietly by myself! I just gave away some tickets to a special movie showing because frankly, the idea of sitting at home on my own, weaving or spinning or knitting and listening to my audio boo k--well, it sounded like pure delight. Every bit of sunny silence is fabulous. I even managed to nap yesterday through a neighbor's yardwork--with chainsaw-- after I came home from being in charge of family service at synagogue. I needed that nap! In honor of that heaven--a nap on a sunny warm afternoon--I managed to catch my whirling dervishes at rest. When I come up the stairs to the second floor, I often see Sally. She's staked out my bed and gosh she's enjoying it! (She especially enjoys the wool counterpanes we leave on there so the bedding isn't quite so, umm, doglicious when we go to sleep.) She sometimes will even share space with me. If you look carefully at that first photo, you can see a white basket in the hallway, full of dog toys. Yup--that's the one! If you've seen a copy of Knit Green, you'll know more about that basket! It's now decommissioned and spends its days holding onto very important dog toys. Harry is often guarding the first floor--here he is in the front hall, keeping the living room, dining room, and staircase upstairs safe from invaders. Happy spring! I hope you get the chance for both long walks with dogs in the sunshine and... a bit of rest afterwards. Yesterday I missed my usual blog post day. That's because I got the chance to give a talk about Knit Green: 20 Projects and Ideas for Sustainability for the Manitoba Eco-Network! The talk went very well and I enjoyed myself. However, between getting downtown on time and my usual pre-talk jitters, it exhausted me for anything else! Had to have a quiet afternoon and a large cup of tea to recover. However, continuing with the green Earth Day theme, here is my new summer dress. Yesterday was also the warmest day this year so far in Manitoba. It hit a high of 21 C! (above 70F.) Although many people stripped down to shorts and sandals, there was a stiff wind, so my dress will wait for another day. In the meanwhile, here's what a little green dye can do for a buttercup yellow dress. The dye was probably a buck or so, and then there's my time to dye it, but all in all, I'm enjoying good value here with this recycled outfit! Lately I have been pondering how much my time is worth, and what I should spend that time on. As a freelancer, I manage my work schedule and I decide how to allot my work hours. For instance--I figure --aside from knitting--that I spent about 8 hours getting The Winnipegger scarf ready for sale. That included things like formatting the pattern, proofreading it, getting outside tech editing support, doing the photo-shoot, etc. I was lucky that the professor could shoot the photos, as then I didn't have to pay a photographer as well-another expense. Anyhow, I was so pleased to post the pattern for sale on Ravelry. So far? Not one single purchase. Nada. Nothing. I know as a designer and writer that a portion of my work is just a business risk. This appears to be part of that risk. Whether my work is calculated at $9 (minimum wage in Manitoba) or $20-30+ (teaching rates) or $35 (editing rates)---well, I just have to hope someone is interested in buying a pattern I post or I lose 8 hours of that income. Never mind the knitting time! For now, it's just available via Ravelry as I don't want to waste the time of my webmaster (another small business owner) in terms of posting it on my site too. We'll see how things go. I remain hopeful that someone will like the pattern enough to consider purchasing it. The books I wrote are another kind of risk--and this morning, I heard of this kind revi ew! Hurray! I haven't had a lot of time for spinning lately. However, when I've spun, it's been exclusively on spindles. Here's a shot of my SpindleWood spindle, complete with a rich brown alpaca/silk blend yarn. This blend of fiber is slick and I had little luck using my Great Wheel to spin some of it up when I got it--nearly a year and a half ago. I'm not sure if it was my inexperience with my new Great Wheel or the tendency of this fiber to drift apart. It lacks the "grab" that wool fibers have. With the control of a fine spindle, it's speedily becoming yarn! I hope these singles will become a luxury sport to dk weight 2 ply in the weeks to come. Oh, one more neat bit of local news. Check out this article--soon the Muslims of Inuvik (that's in the Arctic) will have a place to worship, thanks to those here on the prairies! What a wonderful way to reach out to others. In a place so cold, it is an amazing gift to get an indoor location to gather. That's the news from here! Shari, congratulations! You've won a subscription to Living Crafts Magazine! I'll be emailing you as soon as I finish this post. Other contenders might wonder how I choose these things. I used to print out all the comments, cut them up so each comment was on a different scrap of paper, fold those up and put them into a large bowl. Then I made the professor choose the winner. In other news, weaving has been going slowly, so no new warp for April as of yet. I did several roving rugs and I'm using the last of this warp on some curtain fabric. I'm thinking of making curtains for my kitchen with this. Although you can't tell from the photo, I'm making a stripe d fabric. One stripe of weft is a cream colored wool yarn I got from the Scrap Exchange in Durham, North Carolina. (the warp is from there, too) Since I lived in Durham from 1998 to 2002, this stuff has been marinating in my stash a long time! The same stripe has bits of a nylon white ribbon from Sweden as an accent. I got this at a yarn swap in Winnipeg last summer. The other stripe uses the same cream colored nubby cotton as the warp. I'm hoping this stripe works as a more "see through" option so that hopefully some sunlight will shine through. If you've noticed--I haven't bought a thing yet that was particularly for weaving. It's all from my stash! In the same vein, I went to the Artsjunktion in Winnipeg's Exchange district for the first time last week. This is a nonprofit venture much like the Scrap Exchange--its goal is to keep useful stuff out of the landfill! It's a great resource for artists, teachers, and crafters. I could not believe my luck. I found cotton yarn (a future warp? ), colored cotton thread, several lengths of lovely wool fabric--great for weaving into rugs or sewing into something else, some spools of ribbon, some binding tape, and and....a brand new yellow summer dress in my size. Now, yellow doesn't look good on me, but I am not letting that get in the way. Free is free...might as well make into something I'll use. One yellow empire waist dress went for a swim in a dye bath last Friday. I meant to shoot a photo, but it's already hanging in my closet! I did pay for parking and donated some old records and $5 towards the rent of the warehouse space. That said, I felt a bit guilty taking away all this loot. One man's trash is most definitely another woman's treasure! We're in recovery because this big, friendly raucous dinner out started at 8:30, after sundown, and we didn't get home or to sleep until after midnight. We're usually eating during around 6pm and asleep by, say 10:30. So, even though today is just a regular work day--no holiday anymore--I'm totally tired out! When I was a kid, occasionally we had to blow out holiday candles (for the Sabbath or another holiday) for safety's sake before leaving the house or going to sleep. My grandmother-now 94, btw--always encouraged us to blow out the two candles by saying "PURIM! PASSOVER!" Maybe the P sound made the candles go out faster? It's something I still think about sometimes as I loved being the kid chosen to blow out those candles with the names of two happy holidays! Anyhow, reflecting on this made me realize that Purim (5 weeks before Passover) has long ago passed without me mentioning this great contest opportunity. The kind editor of Living Crafts Magazine would like to give away one free subscription (starting with this issue, the one where my design is on the cover). So, we're having a contest here--just because! 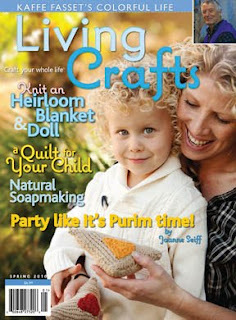 If you'd like to enter to win a subscription to Living Crafts Magazine, please leave a comment at the end of this post. Make sure you also include a way for me to contact you --via your blog or email or some sort of smoke signal. It's also useful to include your name. It seems like a good time of year to talk about creation...what with springtime and all its attendant holidays, etc. That, and a friend who reads my blog sometimes said, "You wrote that whole post about the socks and never described HOW you explained that you design stuff!" Hmm. Well, if it were always easy to explain and I had a check list on how I did it, well then, anybody could do it, right? No, I think I just didn't do an effective job of explaining it to that engineer friend. I'm still struggling. Here are some thoughts. Sometimes, I am inspired by something I see. For instance, a detail I see in a building's design, or in nature, or even a person's sweater in an airport. 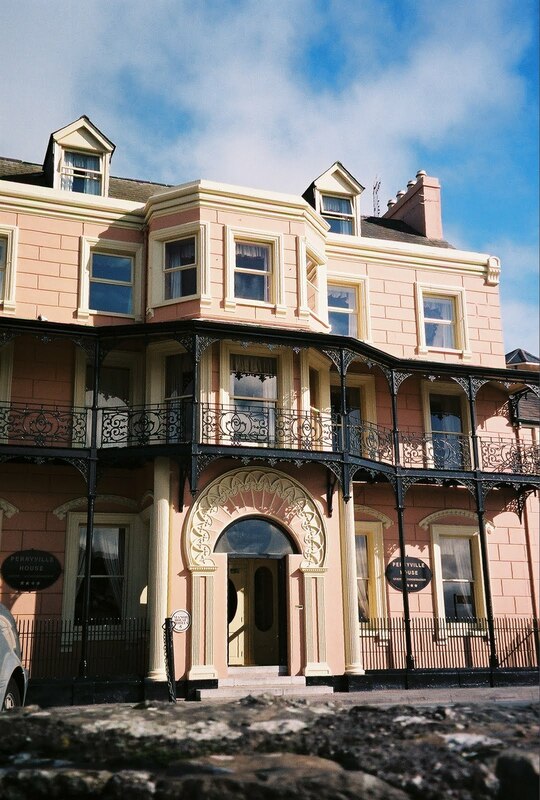 The photos in this post are from a trip to Ireland, about 4 years ago, I think. 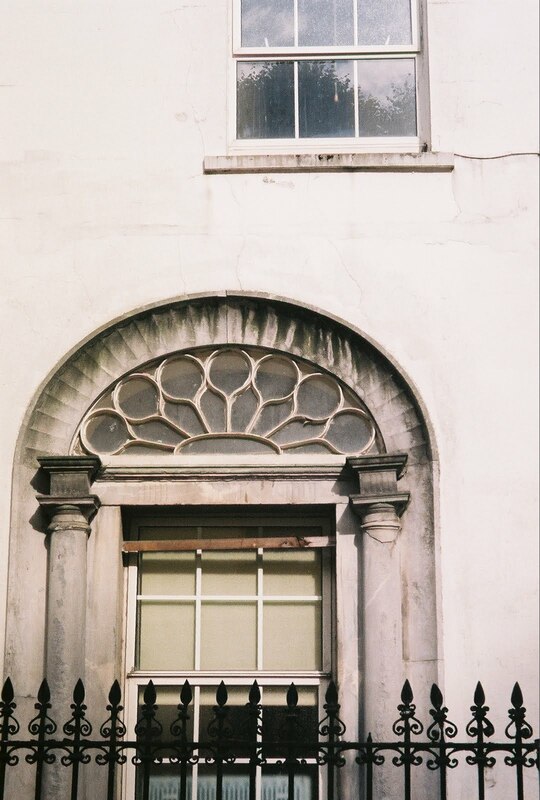 I shot lots of photos of these buildings--something in the curlicues, circles and lines really attracted me. Other times, I get my hands on a really delicious sort of fiber or yarn, and it just calls to me. I swatch and experiment and think about it until I can come up with something to design it into. Swatching sometimes indicates what needle size I'd prefer, what stitch pattern looks best, and how the yarn behaves. These are all essential to creating something that is actually useful later, after knitting. The things I've mentioned, above, often require a bit of day dreaming to get it right. Play, experimentation and brainstorming are all a part of this process at times. This is true for some of my writing projects as well. Taking walks, dreaming, and knitting, spinning or weaving meditatively will often give me the ideas and the solutions to problems I'm thinking about. This is the point where I should mention that I'm not short on ideas. That's not the problem. The problem is getting the ideas to a point where I can sell them (as a design, article, book, etc.) to someone else. That part can be, well, a slog...but more on that in a bit. Another option is when someone asks me to design a specific garment or project. I then work from what the finished project will look like. I choose the right colors of yarn, textures, styles, and crunch the numbers for the design based on a swatch I've knitted. I think the difference between a professional designer/writer and an occasional innovator has a lot to do with the "slog" part of things. Yes, a professional sells things, and the hobbyist might not, but that is not necessarily the definition I think about on my own. After all, Van Gogh was a pretty fine painter and his work didn't sell all that well. I'd still call him a professional! The slog (at least for me) involves getting down every bit of the technical writing of a design. It involves creating attractive photos and good schematics. It means manipulating graphs into charts that knitters can work from. It's creating a satisfying layout for a pdf and making sure I can hire a technical editor and afford to pay her, too. Sometimes, the slog is even just knitting up a design sample that I find boring to knit...and perhaps it's something I'd never wear in a color I don't like...because occasionally, selling a design means using a color I'd never choose and a style that wouldn't ever be flattering for me. That's when it can be a slog and not a joy. When I write, I find some things are fun to do from beginning to end, and other assignments are more of a slog. This doesn't correlate to how technical it is, or how long the article is, or even the subject matter. It might that this part is where the muse comes in. The creativity part is hard to describe, and while I can get into the technical bits, I find that nothing there is inspiring. It's when a day flies by with lots to write about, or when a design just flows out of me without any set backs. It's like the muse dropped by that day, and better yet, she knew what I'd need. Then, the muse leaves and I'm back to the slog. It means finding ways to sell my work, market it, and actually try to earn something from it. That's the not fun part for me. I think sometimes that creativity isn't the problem. It's funding and supporting things that make creativity happen. 50 years ago, a man named John Teal, Jr. started the first musk ox farm in Alaska, where these amazing beasts were cared for and bred in captivity. This man had a dream, and his creativity and love for these animals created an amazing resource for Alaskans. I am the Granddaughter of John Teal Jr, the man who domesticated the Musk Oxen and started a market for its amazing and exotic wool, Qiviut. Our non-profit farm in Palmer Alaska is in great danger of being sold and dissolved, and I am doing everything in my power to keep it going as a sustainable and viable operation. But I need help. I have to raise funds to prevent the sale, to keep the grazing land of our herd of 55 Musk Oxen, and to prove to the board that our project is valuable to the greater community. The knitting and fiber community is an important part of our support network. Not everybody is an artist, and maybe the muse didn't drop by every day... but we all can enjoy those occasional bursts of creativity and dreaming, in ourselves and in others. Some people can help maintain the materials that inspire us all towards becoming creative in our own way. Want to help support musk oxen? Visit the Musk Ox Farm link and maybe you can lend a hand.